Douglasiidae is a very small family, with nine Nearctic species (all in the genus Tinagma), only two of which occur east of the Rocky Mountains. Tinagma gaedikei (Figs. 1, 2) was unknown to science until 2004, when it was collected near Charleston in central Illinois. Its formal description was published the following year (Harrison 2005); since that time, it has been recorded from northern Kentucky as well, by Loran Gibson. 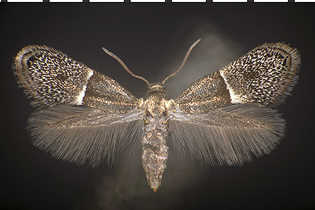 This moth belongs to Gaedike's (1990) balteolellum species group of Tinagma, which differs from the perdicellum group (which includes Tinagma obscurofasciella, covered below) on characters of adult coloration and genital morphology. Prior to the discovery of T. gaedikei, the known Nearctic distribution of the balteolellum species group was restricted to southern California and northern Mexico (where three species have been found); therefore, the discovery of T. gaedikei introduced a substantial change in our knowledge of the biogeography of this species group in North America. Figure 1. Tinagma gaedikei. Adult, collected diurnally on flower of Phacelia purshii. The orange, barrel-shaped egg of T. gaedikei (Fig. 2A) is laid on the flower bract of Miami mist, Phacelia purshii (Hydrophyllaceae) in early May. The larva (Fig. 2B) hatches in early May but apparently does not begin feeding until about two weeks later, by which time senescent fruits of P. purshii (upon which it feeds) are present. It is not known at present whether it completes feeding in spring, or overwinters as a partially grown larva that resumes feeding on new reproductive tissue of P. purshii during the following spring, but either way, it most likely overwinters as a larva, with pupation occurring in mid-April of the second year (this assessment is based on what is known of the biologies of other douglasiid species). Adults begin emerging during the last week of April and can be seen until about 10 May. The diurnal adult (Fig. 2C) shows a strong preference for sitting conspicuously on the flower of P. purshii. Figure 2. Tinagma gaedikei. A, egg; B, larva; C, live adult on flower of Miami mist, Phacelia purshii (Hydrophyllaceae). Tinagma obscurofasciella (Fig. 3) has not been recorded from Illinois but should be sought in the far northern part of the state, where adults would be present probably in mid-May. The larva is reported to be a leaf miner on various rosaceous plants (e.g., Geum, Potentilla). Dr. George Balogh states that he collects adults of this species diurnally in Michigan, in an area where much wild strawberry, Fragaria sp. (Rosaceae) occurs. 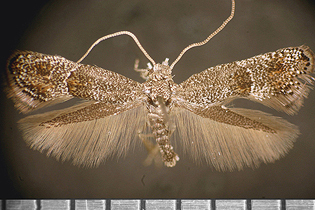 This moth is placed by Gaedike (1990) in the perdicellum species group of Tinagma. Figure 3. Tinagma obscurofasciella. Adult, Michigan, collected diurnally (specimen courtesy of Dr. George Balogh).